Where is the first place we come to do our research? The Internet is the gateway to information and being an affiliate marketer, of course this is where you are going to be delivering your reviews to a captive audience. If you understand how to effectively create a review, you can drive a lot of traffic to your business, and effectively convert a lot of "prospective" buyers into actual buyers. There are some KEY elements to any trustworthy, authoritative websites online. One of these key elements is reviewing products and services within their respective industry. That is what this lesson is going to teach you all about, how to create through and very insightful reviews on your website. Reviews will naturally become a core component of your website moving forward and you will likely be making many product/service recommendations over time, and occasionally, helping people avoid products or services that may not help them out. Your first focus is going to be the integration of Wealthy Affiliate into your site, but there are many affiliate programs out there that you will be able to leverage through time to create multiple streams of income. Reviewing and promoting many different products is going to happen with time. 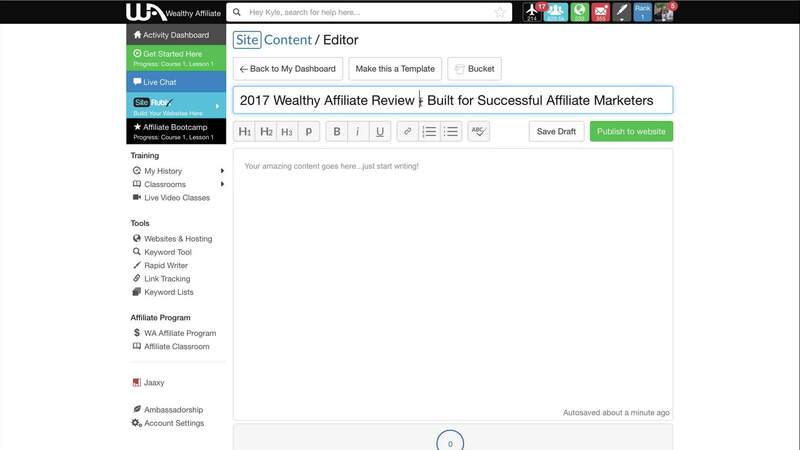 Before I get into things, I would love for you to watch the following video on how to create and architect a proper review (I use Wealthy Affiliate in my example). When people go to purchase anything online or offline, typically they will review it. Unless it is a complete impulse buy (which does happen to the best of us), we will spend our time researching a product before we purchase it. We want to be informed and feel as though we are making the best purchasing decision possible. All of your reviews, and content for that matter, need to capture the interest of your audience. If you can't capture the interest, people will get through the first paragraph of your content and leave. The hard work is getting someone to your site and if you are captivating with your content, they will stay to read what you have to say. To be "captivating" you should write as though you are writing to a friend, explaining a product or service to them. Explaining the benefits of it, how their life will be better having it than not having it. Plain and simple, if you don't provide people with enough information to make a purchasing decision (either to buy or not to buy a product/service), then they are going to vacate your site and resume their research elsewhere. That equates to LOST traffic and revenue.This is the reason you want to offer a very informative review, something that is comprehensive enough that someone can make a decision after reading your review. One that builds enough trust and offers people enough help that they feel comfortable enough with your "words" that they decide. A review should be accurate to the best of your knowledge. Make sure that when you create your reviews, that you base it on factual information. Sure it is fine to have an opinion based on facts, but you don't want to be in a situation where you are making stuff up or creating a fabricated story. Lots of ways to put together and accurate and precise review, utilize all of the resources available to you. If you feel a product is great because of XYZ, then state it. If you feel it is lacking because of XYZ, then state that. Your content is unique to you and the same way that you would email a friend explaining a product/service that they should try or not try, is the same way you should present your content within your reviews. Be opinionated, it will make your reviews much more interesting to read and will lead to much better results. Although your review is going to be a critical element of your website and you are going to be able to link to it from many places moving forward, with ALL of your content you create your goal is also going to be to rank in Google, Bing & Yahoo. And this starts with the KEYWORD phrase that you choose. Reviews are no different and when someone goes to look for information on something online, there are a few key characteristics and behaviours that you should be aware of with their research. Here is a list of potential keywords that you could use within the title of your post. Here is the title I have selected for my post. Ideally, you want to choose a title that you are not going to be changing. Once you decide on the title, and in particular once your review post ranks in Google and other search engines, you don't want to be updating your title too often (as it can tank your rankings in Google). So choose a title that (a) has your targeting keyword somewhere within it (b) that is captivating, and (c) is something that you are happy with. Great! You have your post title set out, this is going to be the premise of your review, but ultimately your goal is going to be to provide people with a BRILLIANTLY captivating, informative, accurate and opinionated review (remember the 4 CIAO principles). When you construct your review, there are several elements that will remain critical to your review and that I tend to focus on within all my reviews in terms of the structure and design. If you look at every successful review website out there and from my personal experience, it is very important not just to offer someone a thorough and informative review, but also to offer them a much lighter weight and easier to read "overview". This is in essence of an overall product breakdown based on the main elements of the product or service. See the example within my WA review. These should be consistent on your website for "similar" products. For example, if I were to review other products that were in the same industry as Wealthy Affiliate, I would likely want to use the very same criteria as this. You can choose the criteria you will be review, it is your content but this should give you a few ideas as to some "ranking categories" that you can have within your reviews for Wealthy Affiliate and similar industry related products. Be unique and original. Within your content, you are going to have internal headlines using H3 tags (the size of the font). These serve many practical uses. The first being that they break up your content and make it more readable. Nobody likes to read one big massive block of text, it is cumbersome and strains the readers eyes. Secondly, it helps you foreshadow the next topic of discussion. In the case of the screenshot below, I am foreshadowing my section on Wealthy Affiliate Support by indicating that it is a community of caring experts. This is MUCH more interesting than having a boring title like "Wealthy Affiliate Support". So make sure you make full use of headlines within your content, it will lead to many more people reading your content and ultimately more $$. The last main focus here is going to be call to action links that take your website visitors to Wealthy Affiliate, through your affiliate link. Remember, as your will want to get your affiliate link through the "Program Details" tab, at the top of the page (as shown below). That is your link you will be using on your website in which will track your referrals and ultimately the revenue you generate from your site. To add your link, simply highlight the text you want to link and then click the link button (chain link icon) within the top header. Then choose "Insert Link". A modal will pop-up, and then within the "URL" field, you are going to add your affiliate link. The key to a successful call-to-action link is to create one that is entices someone to click it and it is contextually relevant to the content surrounding it. Here is an example of a call-to-action link that I created within the "training" section on my review. These are the three main focuses of the review, outside of course creating quality, thorough content, you want to put some emphasis on having a "shortened" overview, creating internal headlines, and call-to-action links. In terms of a site like Wealthy Affiliate, you have hands on experience with it. 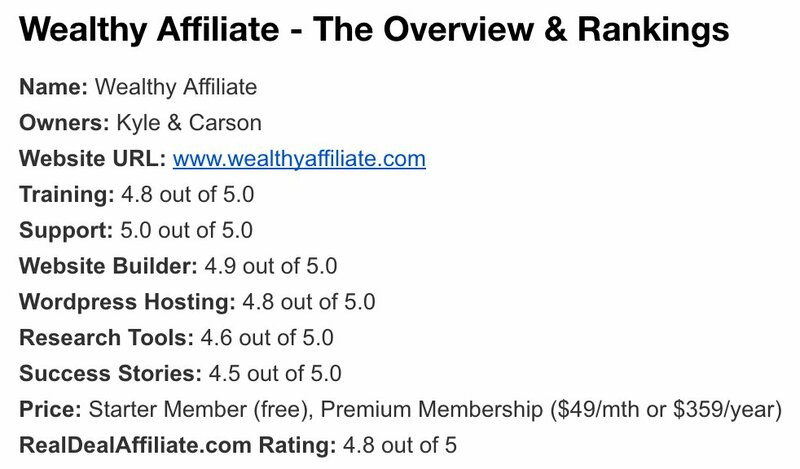 If you have a website in an industry that is related to the services offered here at Wealthy Affiliate, you could write a thorough, insightful, accurate, and opinonated review. You have hands on experience, you have likely personally been connected with many members here at WA (myself and Carson include), and you have gotten a good grasp of the helpful, forward thinking and "members first" nature of WA. We haven't changed our prices in 12 years, we have a team of 25 people working behind the scenes to move the technology, training and offering far beyond anything else offered within this space. That is our focus, and something we invest 60-70 hours per week working towards. What was $359 and people loved as a “keyword list” site back in 2005, is now something that is obviously "light years" more sophisticated, elaborate and useful in 2017, something that is still $359 per year. Comparable hosting alone, is $250 per month and as we progress through 2017, there won't be a Managed hosting company in the industry that can compete with the hosting that we offer here at WA. Look around the platform when constructing your review and make it personal to you and your experience. A few things you could focus on. That is just to name a few of the platforms here at WA that you could integrate into your review. Of course you don't need to write a small novel and included everything, but remember, you want to be Informative and thorough. It will lead to much better conversions and a better experience for your visitors (and ultimately better rankings). The last task is very straightforward. You are going to simply be publishing your content to your website. Make sure you publish your content as a "Post". The reason for this is that you are going to want to allow for comments within your review, which is going to be a critical component of your review, building trust and conversions moving forward.